Simply clicking on the image of the checkbox like below will not work. Sikuli does not know which checkbox we are referring to. It simply clicks on the first one it finds. First we want to obtain the region the Dock pane occupies on the screen. 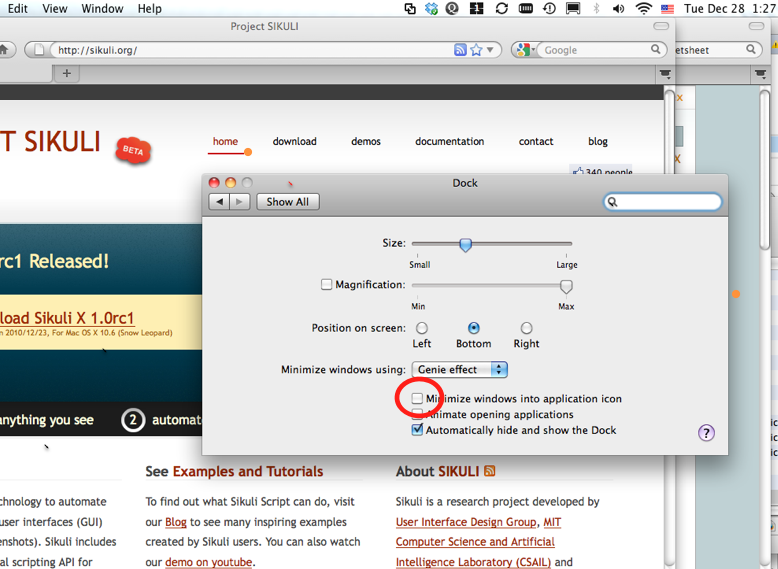 One way to accomplish this is to use a spatial operator to obtain a region below the title bar of the Dock pane. It finds the title bar and then defines the region 300 pixels below, using the spatial operator below. The resulting region is assigned to the variable reg, which is the orange rectangle in the figure above. Next, we can search within the region reg for the label text of the checkbox we want to check and click on it. Uuups - now Sikuli will click on the center of the label. However, what we want is to click the check box on the left of the label. 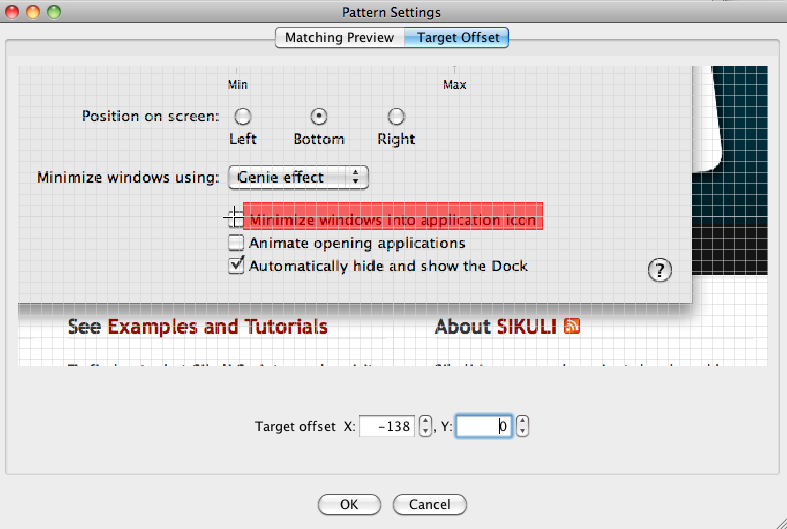 Sikuli IDE provides a convenient dialog for specifying where to click relative to the center of a pattern. This is known as the target offset. The dialog can be activated simply by clicking on the thumbnail image in the IDE. We can click on the checkbox to indicate the desired location of the click point. In this example, the offset is then determined to be -137 in x, which means 137 pixels to the left of the center of the text label. After confirming the offset, the thumbnail in the script editor will be updated showing a small red cross (click point) now at the far left. Now click(labelText) will do the right thing and click on the checkbox instead of the center of the text label.